In ancient times, a great battle was waged between a master mage, Enno Ozuno, and an evil demon goddess, Karuma. Unfortunately, Enno didn't have the strength to defeat her alone and was forced to call upon Zenki, a powerful protector demon. 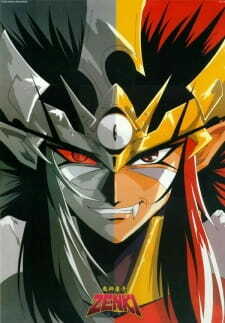 After Karuma was defeated, Enno sealed Zenki away in a pillar located inside his temple. 1,200 years after this epic battle, Enno's descendant, Chiaki, spends her days showing tourists around her hometown of Shikigami-cho and doing exorcisms to pay the bills. One day, two thieves enter the town in hopes of opening a seal in the Ozuno temple and releasing the hidden treasure from within. However, what actually pops out is a dark entity that attaches itself to the henchmen, transforming them into demonic beings. After this transformation, they begin a rampage through the temple, terrorizing poor Chiaki. It is now up to this young progeny to unleash her family's powers to summon Zenki and save Shikigami-cho from these demons, as well as the evil entities sure to follow in their footsteps. To sum up this anime in three words: "It's very 90s"
-The demons, besides the 'nice' ones, look like classic demons from Japanese paintings. They're fairly well drawn and interesting to look at. -The overall art is a little dated and generic but is still nice to look at. -The music is pretty forgettable and the sounds used throughout sound as if they were ripped from well known audios that have been heard a hundred times over. -There is very little to no character development and they all fall into tropes. The perverted old grandfather, the whiny high school girl, the all muscle and no brains demon who yells about everything and cares about no one (if zenki isn't basked off goku i'll eat my left shoe). -I wanted to like this show. I kept skipping large chunks of each episode hoping something interesting or new would happen. Nothing ever did. Even the ending climaxes for archs were meh. -My biggest peeve is it suffers from magical girl transformation syndrome. First, it's one stock transformation. Then two. Then three every episode as the show progresses. It gets redundant and is a waste of screen time. -You could probably watch the first episode of each arch then skip to any of the episodes and feel like you haven't missed a thing. Finally done with this one.